TransitionITnow is a business solutions company specializing in online services. We offer affordable, integrated solutions for every type of business. Most important to us is that our clients don't waste a penny on doing things that don't work. Our success-focused philosophy is simple. For every client, first we step back to see the big picture. Then, we step in to concentrate on the details. The results speak for themselves. We provide a digital technology platform and creative services integrated with business expertise and marketing strategies. We are value chain specialists. That means we connect businesses inside and out across supply, sales channels and customer segments. We are business advisors. We suggest various digital strategies that our clients can use to grow. We are Web developers. We build network architectures to bridge buyers, sellers and brands using distributed networks. Our clients include brands, SMBs and business professionals and their teams. Because our specialty is in connecting the dots we can start at any point in a business story. Brands turn to us to get their messaging connected with customer-facing sales channels or inside sales staffs. We help VARs and Dealers turn their B2B brand relationships into their own business identity to impress prospects, connect with clients and appreciate their services. Professionals, such as doctors, life coaches, and lawyers, come to us to connect with clients while achieving their compliance issues. Online merchandisers are amazed by our superior e-commerce and mobile marketing capabilities. Our clients are domiciled in the U.S. and Canada or countries with offices in the Americas. TransitionITnow serves Greater Los Angeles area businesses located in downtown LA, Studio City 91604, Burbank, Hollywood, West Los Angeles, Beverly Hills, Santa Monica and areas around the city limits. Our client list covers various enterprises in Healthcare, Technology, Telecom, Wellness, Retail, Entertainment, Professional Services, and Manufacturing. We welcome all businesses looking for ways to grow by integrating sound strategy, creative excellence, and integrated technology. It'll take you only 15-20 minutes to hear about the latest innovations in Cloud Solutions. No obligation to buy. 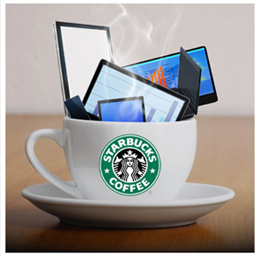 Enjoy a Starbuck's Cup of Coffee on us (we’ll send a free $10 coffee card) just for taking the time to listen. Call us or use the contact form.